Araucarioxylon arizonicum (the state fossil of Arizona) is an extinct conifer of the late Triassic, a time when what is now Petrified Forest National Park was a low, near equatorial, plain. Mountain streams, flowing to the sea, carried volcanic ash high in silicon bound as orthosilicic acid and as crystals of silicon dioxide, quartz. Trees deposited in rivers were covered in sediment, their tissues were saturated, and tubes of xylem and phloem provided easy access to deep within the plant. The rest is history. Negatively charged crystals of quartz accumulated in cells and cast organic tissue in rock – preserving specimens in minute detail. 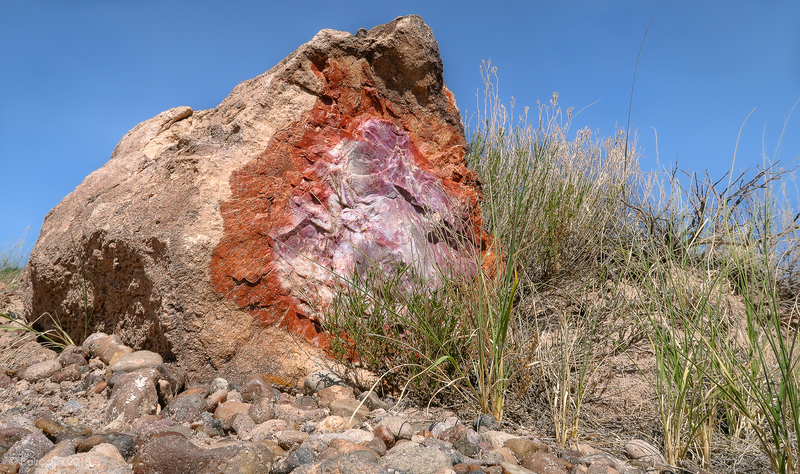 The colors in petrified wood are dependent upon mineral ions bound to quartz. Below, relatively pure quartz is white, iron oxides may be responsible for reds and browns, and manganese may be associated with hues of pink and orange.